We had a wonderful time as hostal forestal! We were in Santiago for three days and the location is trully great! Very close to Bellavista and other points of interest. We did everything on foot. Apart from that, staff was really friendly (specially Juan and Cassandra) helping us get around and everything. The room (private) was really comfortable and cleaned every day. Breakfast is also good. Overall, we had an amazing experience! 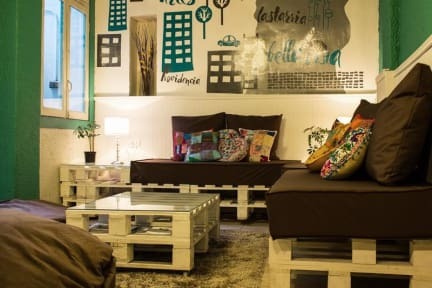 Um dos melhores Hostels que eu ha fiquei. Muito bom!! Super legal, ótima localização e atendimento !! recomendamos muitooo !! It was an amazing experience to stay in Hostal Forestal. The staff was really nice, Juan was a great party planner and Benjamin was nice and helpful. The place was clean and organized. The location was AMAZING really close to a street with a lot of restaurants, parks and public transportation. I think a good point is that even when we were partying in the hostel, the staff were really carefull that we didn't made too much noise to bother the other guests. Achei muito bom! Boa localização. As fotos mostram realmente o ambiente (não está sendo iludido pela fotografia). Banheiros um pouco quebrados mas funcionam bem. Apesar de falar que tem estacionamento gratuito, o estacionamento é na rua (9PM-9AM) e tem um estacionamento "amigo" ao lado que me cobrou 3000 pesos somente para noite. Durante o dia fica mais complicado. Tem que estacionar mais longe (umas 5 quadras de distância, no Patio Bellavista pelo dobro do valor diurno). Melhor hostel que fiquei em Santiago. Café da manhã ótimo, banho quente e bastante àgua, bem limpo. Bem localizado, limpeza impecável e atividades que geram um clima agradável entre os viajantes. Overall, one of the greatest hostels I’ve ever been to. Staff was amazingly friendly, helpful (cheers to Juan who always cheered our nights (beerpong night was the best!) and when we needed to eat breakfast before the time (early tour) they helped us pack some food. Showers are always clean and there’s always hot water. My room was a bit small and the noise could go through the walls, but we didn’t have any problems with noise at night. Will definitely stay again. Adoramos ter escolhido esse Hostal para ficarmos, excelente localização, o hostel não é grande, por isso mais aconchegante, os colaboradores também muito simpáticos, em resumo, indico esse lugar! Ambiente agradável e muito bonito. Atendimento excelente!